All right folks, I am going to attempt to make a modification that allows players to buy any uniform (whether existing or only in model form) from the seller at the Sentinel base from the very beginning (as soon as you get access to his stock). 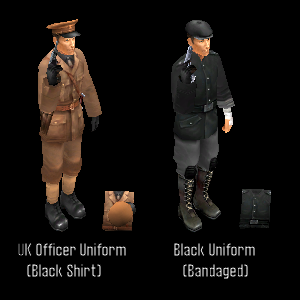 Since the uniforms are separate items in S^3 as compared to S^2 where they were simple models - they need to be created first. I'll try to keep the mod light (sizewise) so only the textures and materials available in the game will be used for v 1.0 of the mod. Remember the "Manor" special encounter from S^2 where the fabled "Sea Devil" rifle was located. It had German and Italian troops in the area. Since Italian models are still in the game, I decided to make them fully usable. 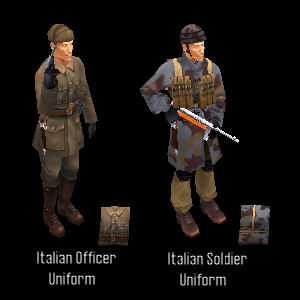 Italian Uniforms Done! Another special encounter "Road Bend" with Katana had Japanese troops and a bunch of "Ninjas". Now one can dress like them. If you desire to serve some drinks or repair a few Panzerkleins why not dress appropriately. 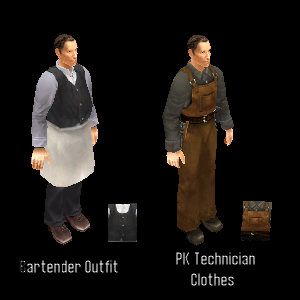 Bartender and EBase PK technician Done! - Silent Storm on Steam Greenlight has been approved 08/28/13! My Blogs: H&S blog and just funny book titles I created for my kids( unrelated to Silent Storm). The guy on the left was supposedly a double agent from S^2 (or was it triple? I don't remember). Couldn't fool me though, his shirt is not pink it's black! And he is wearing gloves! An absolute triple agent if you ask me. 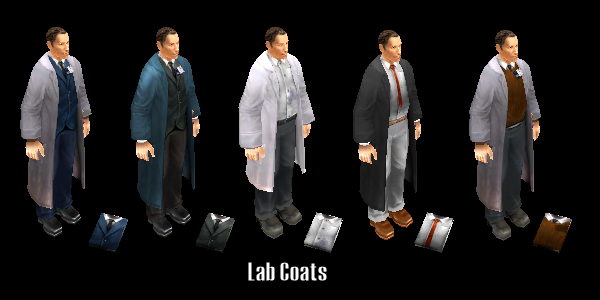 The cripple on the right is ...umm - one of those easily forgettable S^3 characters (at least for me). Anyway, if your male characters put that uniform on - they'll look crippled too, but act like nothing happened. Very fashionable. Black shirt agent and Bandaged Done! Black and Fall Camos Done! They are not cheap, mind you. That SOB at the base overcharges for everything. Maybe I need to enable combat at that location just once. Guess who is going to go first? Yup, he is. Hanke and SS outfits Done! This is the outfit I am currently using in Silent Storm for the main hero. Thats the one I want back. 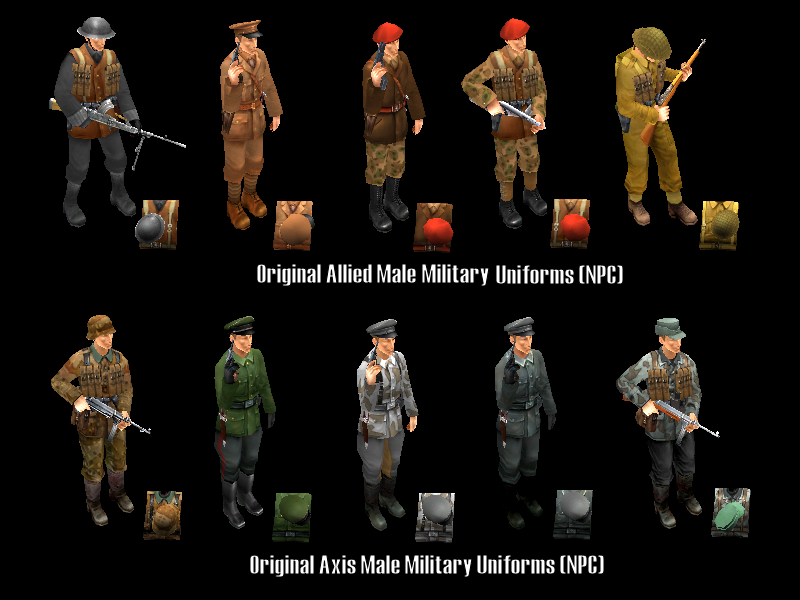 I am not sure if these are from the Axis Skin pack or the normal uniforms but it looks great. There where some more in there, mostly civilian/researcher and engineer models as well as US Army Soldier and US Army Commander that I think are already in Silent Storm as an outfit. 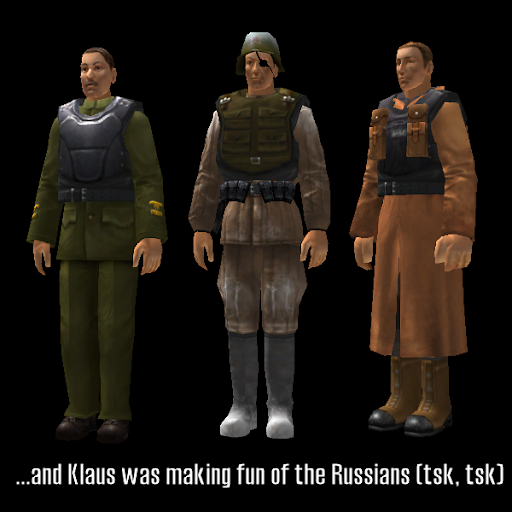 There was also some regular Russian soldier uniforms, plus the russian officer model and the russian soldier models with snow on them. 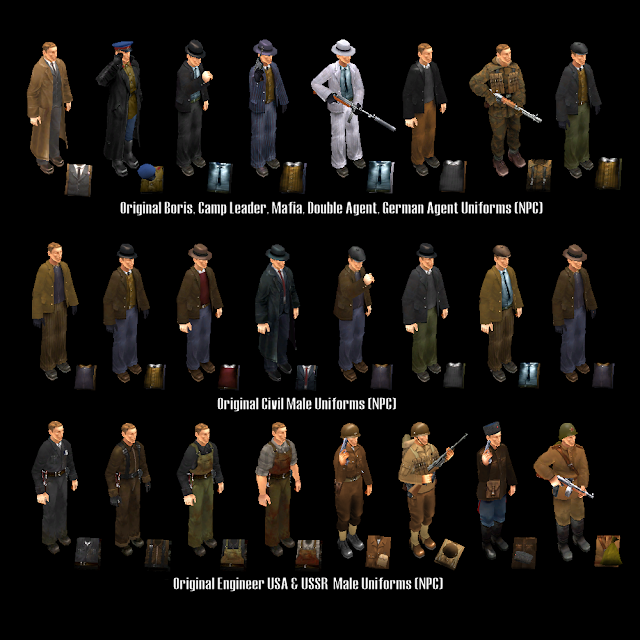 Ah yes, the whole slew of German soldier models where in there too, mostly the Fallschirmjäger ones. I should see if there is more if you go and look at the Axis side.Let me know if you need screens or anything so I can provide them. 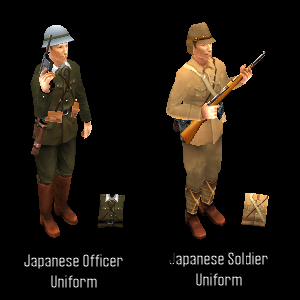 Anyway, will it be possible to also add custom uniforms? 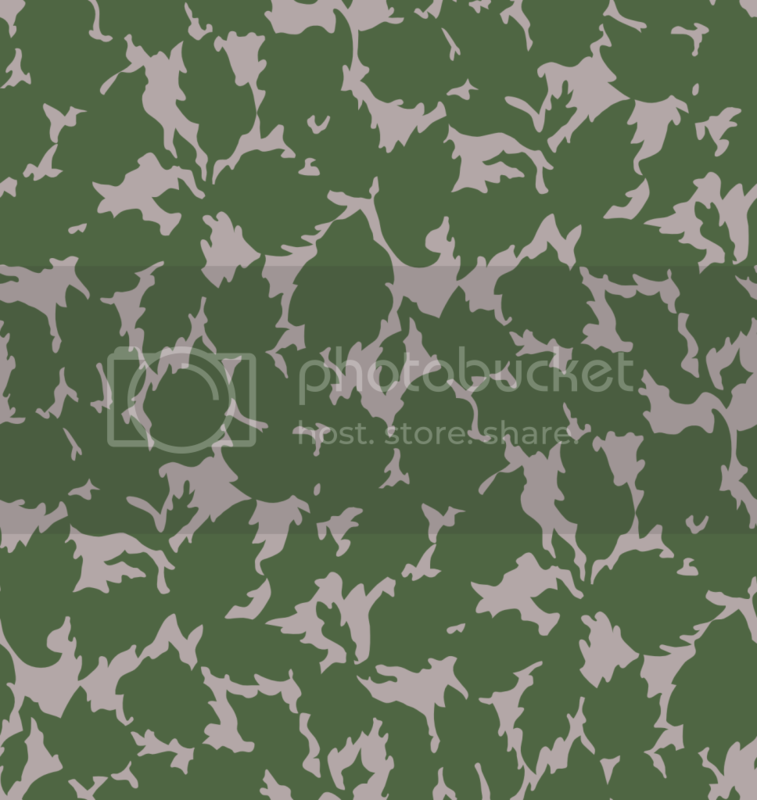 I could provide camo textures for such a thing, all authentic WW2 camos, mostly of Russian and American origin, but I also should have some german camo patterns as well. So please let me know. I am not familiar with the mod you are referring to. As for Commando uniforms they are already available in Sentinels along with some others. - Allied Female soldier now can wear beret. I changed the uniform model to match that. - The same with Axis soldier girl. 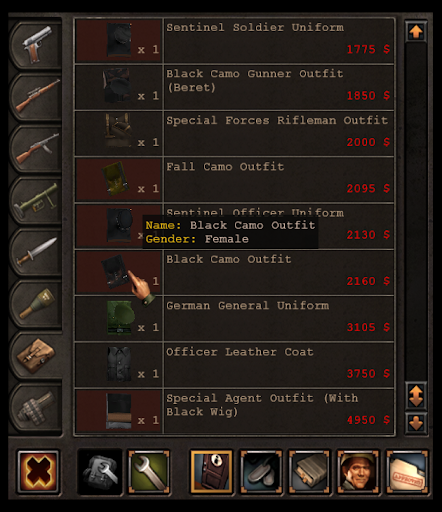 Her uniform features the camo helmet from elite soldier NPC uniform. - Axis scout doesn't have that mask permanently attached to his face. It comes with the uniform and goes with it once you change it. No changes here. They come with their own uniforms. Here are your commandos and paratrooopers. I'll address your other points in the next post. There were no Thor's Hammer uniforms available in the original Sentinels. I created these using the MG soldier model with elite commander body material. A perfect fit, wouldn't you say? 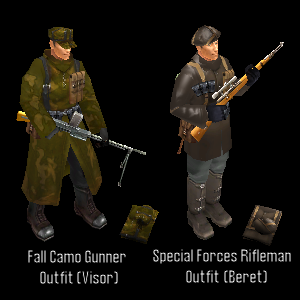 To the left: Beret is allied soldier cap model with sentinel colonel body material. 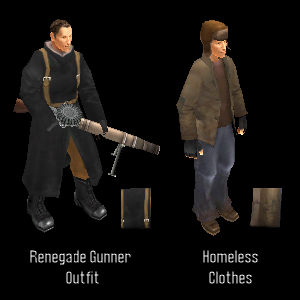 Uniform layout is Rifle ammo oriented with some fancy terror backpack and a few gadgets and flasks and pouches. This MG soldier model is bulkier and more man-like looking than the thinner looking camos. I am still entertaining the idea to restrict these to male characters and the thinner ones to females.What do you think? Now, If you are talking about importing new textures and fitting them on existing models - I've done this before (actually many times). Just keep in mind I'd like to keep the mod small (at least for the moment). Right now it is only 159kb in size. We can discuss it I'll just hold off on importing the textures until all the possible combos using the original textures, items and models are exhausted. 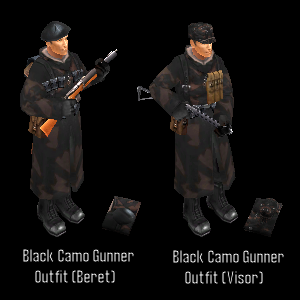 On the left: The same Terror MG soldier model with fall camo material from elite soldier body. Cap has the same texture. 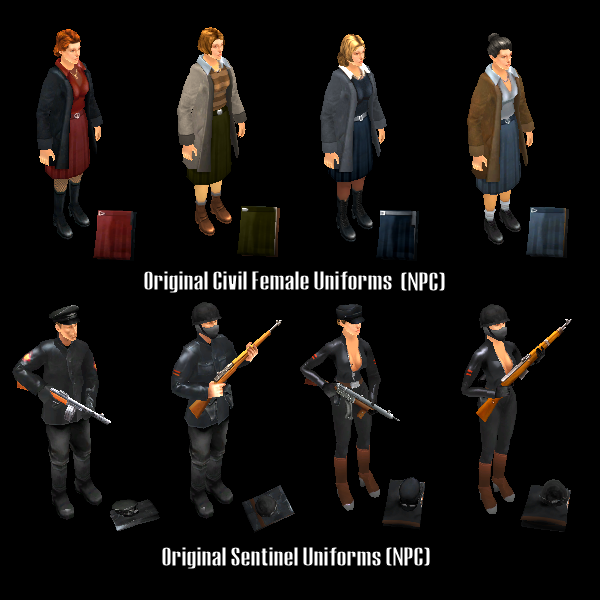 The uniform model is borrowed from Sentinel female officer. 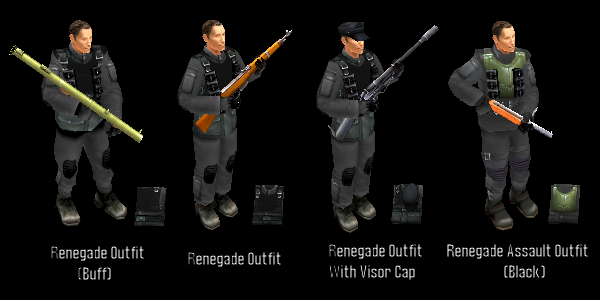 On the right: Terror Rifle soldier with beret. Nice brown leather! 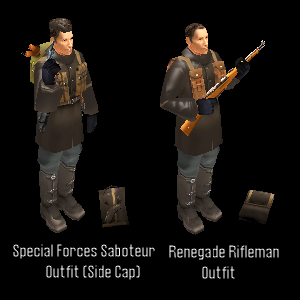 Two more Terror Rifle soldier uniforms. 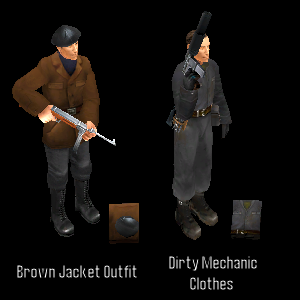 One has engineer style layout and the other one is rifle ammo heavy. 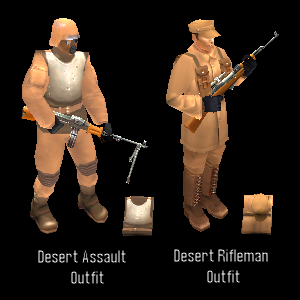 Desert Hammer outfits are getting uniforms. Desert version of the MG soldier and the "super" soldier uniforms done! 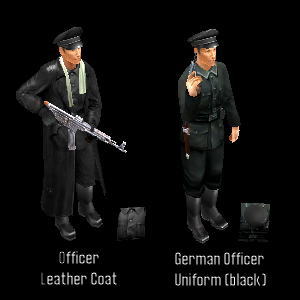 Most of the uniforms use German Officer uniform model. I have to say it is probably the most versatile model as most materials fit that model quite well. These guys look mean. I always felt that the helmets with masks were somewhat an overkill. But that's how it is... unless we decide to change it. Btw, if you have any naming (renaming) suggestions - I'll consider them. Regular MG Soldier variants - DONE! Right. Hmm... 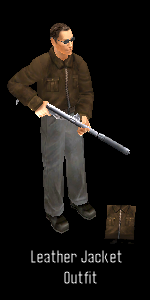 It is my pleasure to introduce you to the guy responsible for all of the gunner outfits. Ladies and Gentlemen, please meet the MG soldier! Nevemind the homeless guy, he just tagged along for the ride. Major and Police Officer uniforms done! Some say they won the WWII. By the looks of them - they could have. God forbid to end up in those shoes! Actually, those Valenki (wool felt boots in the middle) are very warm. Professor Kohler had a decent suit so did the Otter. I thought they should be available as uniforms. 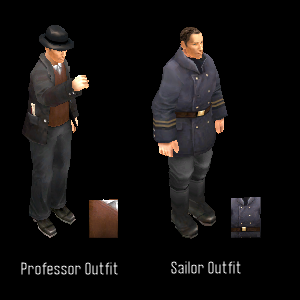 Professor and Sailor outfits Done! These guys are pure Sentinel babies - from two snowy missions. 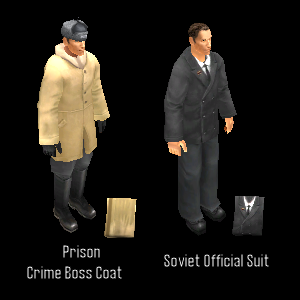 Prison Leader and Soviet Official Uniforms are done! These guys are nothing extraordinary, but I liked the jacket. As for the dirty mechanic - he happened to be there too, so I figured "why not", right? 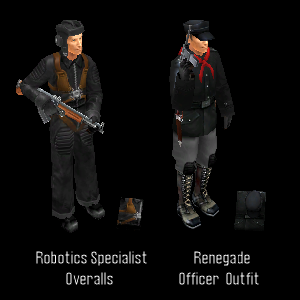 Terror Leader and Terror Specialist uniforms - done! Oh, boy! I remember being annoyed with the script that let that US agent escape every time I started shooting at him. What I did was - have all my people aim at him, then select them as a group and fire simultaneously. The following "Damn, we needed him alive" were music to me ears. USA agent uniform - done! I am on a roll! Whoo-hoo! And finally comes the last batch for today (maybe). Helen (or Helena, the one on the right) was the main antagonist in S^2. Everything she had was top notch: the flying PK with killer laser turrets, the awesome base in the North Sea and the outfit that made male characters miss a lot and female chacters cuss a lot. Comes with a complimentary authentic black wig. 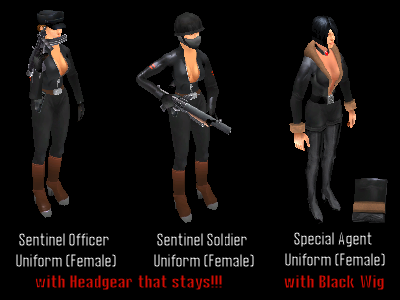 Redone Sentinel Female Uniforms and the Special Agent Uniform are done! Taking an opportunity I want to ask u about your H&S mod, it looks really great and huge, when it will be released. Now I just need a mod that increases the Grenade Range and maybe makes the medical and Engineering items eaiser to use and I am set. 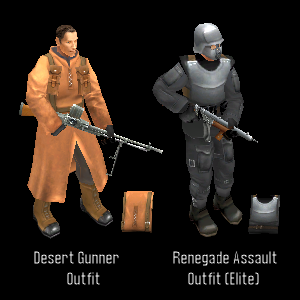 As for the names of the uniforms: the Renegade Aassault Uniforms I would name "Heavy Trooper Uniform" or "Armored Soldier" and the version should be then Black and Desert etc. The leather Jacket outfit could be named "Spy fashion" or "Agent outfit" it would make more sense. 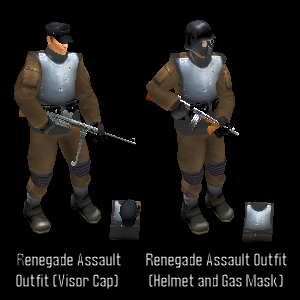 One thing I was wondering if that would be possible: I recall that in Silent Storm the Renegade Soldiers in the Fall Camo Outfits wore Gasmask all the time, would it be possible to use these Gasmask for other outfits as well, like the Renegade Assault Uniforms etc.? Or how about mixing the armor with the camo uniforms? I always liked them, they looked cool. Also so you know why I asked for custom camo uniforms: I found it stupid that you are part of a Special Operations group and aside from Snipers, no Camo Uniforms whee available for you, despite the fact that in 1943 the British issued Denison Camo Smocks to Para Troopers and SAS and the USA had given out Camo Uniforms to their Marines at that time, the M42 camo also known as Frogskin, Leafpattern or Duckhunter Camo. Not to mention the self made camo uniforms of the US Airborne Pathfinder Units. 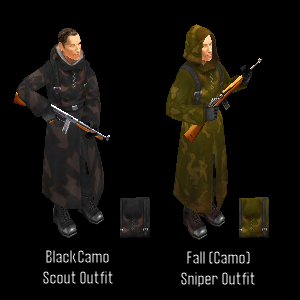 Also the Russians also had more camo patterns at that time, like the M1941 summer camo uniform and with Sentinels there would also be the M1944 camo coverall. So, I just thought that maybe it would be possible to add them to the game for even more variety. Just an idea. Anyway I am looking forward to this mod. How many copies of items do you think the seller should have? I am not working on the H&S mod at the moment. It got corrupted on my win7 machine (I have an older back up though) and as a result of that my modding attempts had to migrate to a different rig with winXP. I am thinking of creating a more compact version of it for Sentinels. Now here is the catch: if the community wants it to be done any time soon (I work fast) they'd need to participate. Constant feedback for - plot development, dialogs, loot ideas, areas and layout - are required. Step by step, unit by unit, one encounter at a time. If someone has a script they want me to use, a scenario twist they want to implement, a texture they think will benefit the visuals, etc. - I will definately consider those. It can be a simple sandbox scenario or a more complex scenario structure. Depending on what the folks want and how feasible I deem it to be. A realistic initial goal I'd set would be a Three template demo in two months time. Example 1 : "I have this idea of starting the scenario with my hero imprisoned in Nazi jail and criminal charges are unknown. A high ranking SS officer comes and arranges hero's release. His conditions are simple: work for me for a year and you are home free. 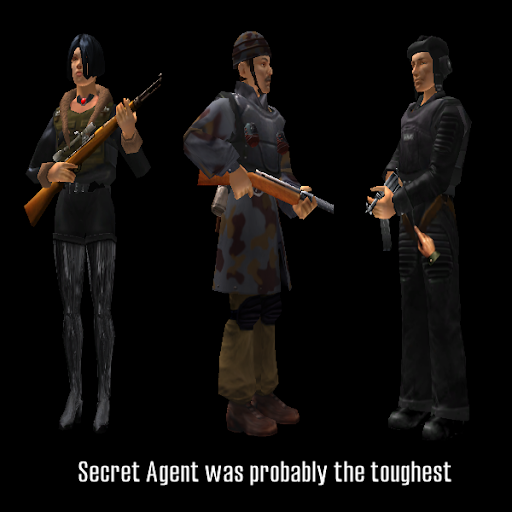 Type of work ranges from assassinations of various officials and stealing important documents, to blowing up facilities and providing support and cover for other operatives. Along the way the hero (or more likely the human player) discovers the truth about themselves and the world around them... (I'll provide the specific details if you are interested)"
Example 2 : "Well, how about a random encounter somewhere in the forest, with some bandits talking about some treasure or map they found. Yet, being the geniuses that they are, they can't figure out where it is. Now the trick is in wording in the note they found. Requires a little thinking on player's part. I have the rough draft of the text. You think you could implement it in your scenario? I can help with scripting it, btw." Thorondor, for example, proposed a plot "Replacements" in the thread titled "Your perfect scenario". I don't know if he wanted to work on it or not though. What prices do you think would be reasonable? I could place them on different mission and/or random encounter templates. That way you could find them yourself. I already changed the automatic perk assignment for all the hirable NPC ("PerksToTakes" db table changed the values to -1). Now you choose their perks yourself. What changes would you like to see in medical and engineering types of items? Easier? How? To bring requirements down or to increase the number of uses? To increase the bonus they provide? I'll look into that, thanks Lt.
Let's finish the vanilla ones first. If you have textures ready - please post them in this thread (or just links to them will do). Good idea, post the textures and think of the models they might look good on (I posted all the original models a few posts up). It IS possible! 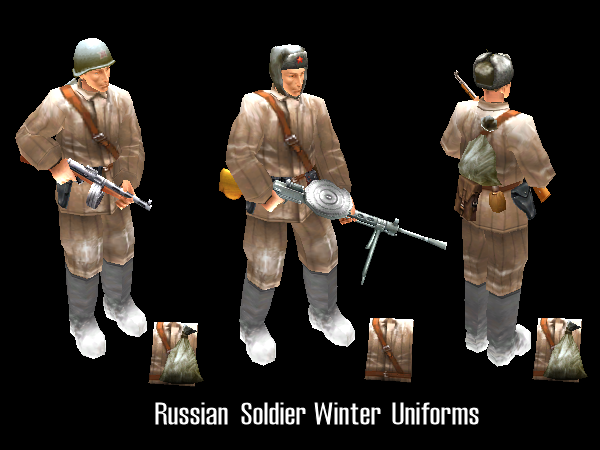 All right, Russian soldier winter uniforms. There were only three types of headgear covered with snow - hence three uniforms. Personally, I'd take the second one. Looks cozy. 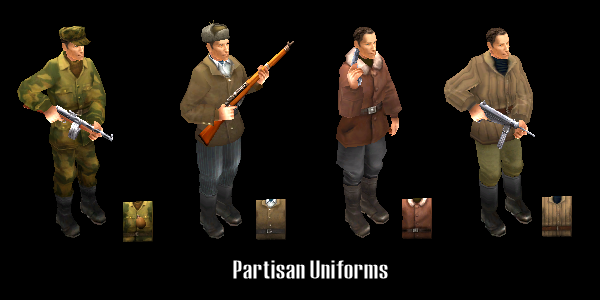 USSR soldier winter uniforms are done! 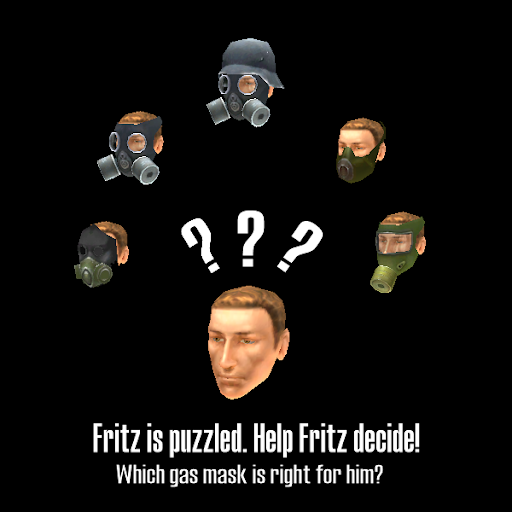 Yes, the gas masks. 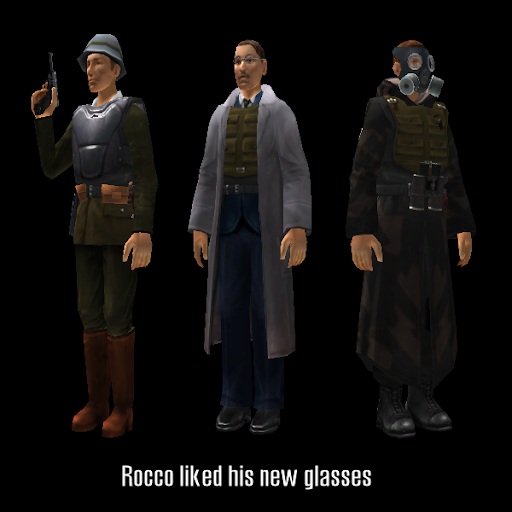 There are a few in the game: German, Terror and Allied. Not all faces will qualify. Big faces like Rocco's or Mike's will stick out, unfortunately. Nothing I can do about it. 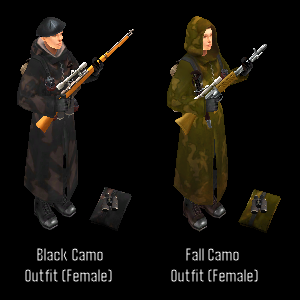 I tried to apply german double filter to the hooded fall camo - the filters were sticking out so bad I removed that uniform version. Just didn't look right. - "Black (or Fall) Camo & Double Filter Gas Mask" (for German version with double filters). 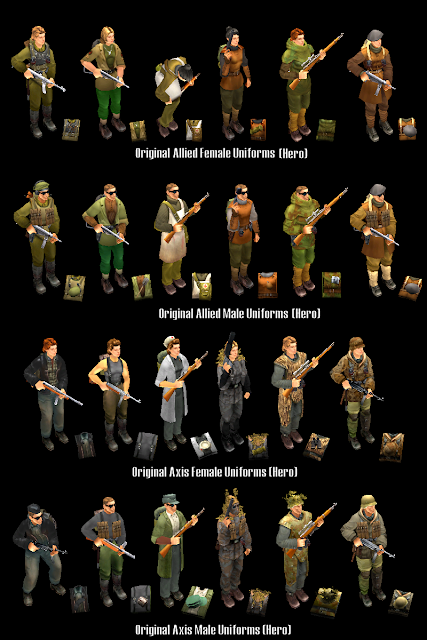 German Female Sniper Uniform model was used for all of these. You know, a lot of time ago H&S has started as biggest mod for ss2, it was about 300-500mb as demo for the future game. And only after this demo was released in internet and game magazines CD's, the people attention in the official forum increased repeatedly. So, for all this time u are working on this mod, don't you think about releasing some kind of demo, or cut it into parts? As for me, your mod is looking like global, and its seems to be big number of awesome detailed maps in it, like in Stalingrad mod by Natrix. About the copies, 6 will be great i guess. "Now your engineer is actually useful! This mod serves a much needed function, making it easier to use all medical and engineering items in the game. This counters the great difficulty had in raising these skills in the regular game. In technical language, the mod multiplies by 2/3 the skill required for successful use of a medical or engineering item." 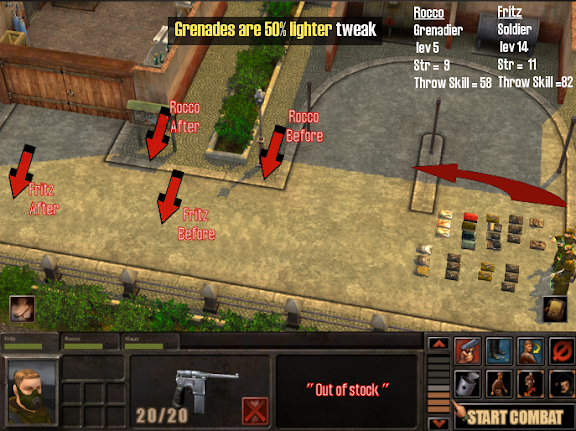 It basically half's the weight of all the grenades so you can throw them further. 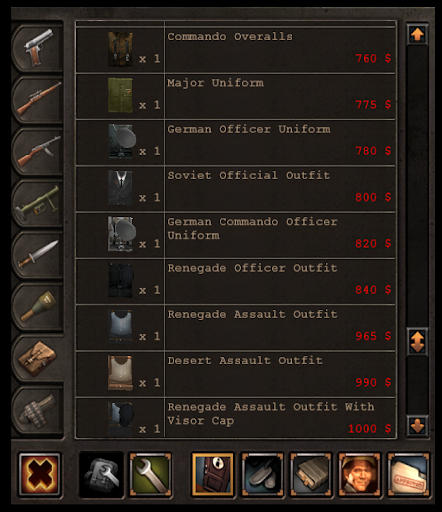 Regarding the prices for the uniforms: I dont know, but 2000 Dollars for a surplus uniform sounds a bit much, dont you think? 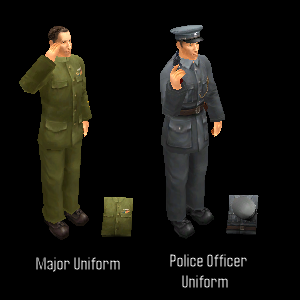 The more common uniforms should start around 100-150 $ and the more rare uniforms maybe should be like 300 to 500 while stuff like those Assault Uniforms that have armor should be like 700 $ or something. Just an idea. 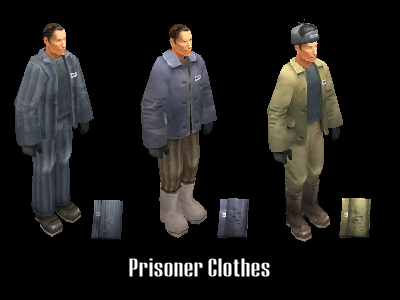 The amont of uniforms in stock should vary, more common uniforms have greater stockade like 10 or 20 in stock and the more rare or exotic uniforms should have like 2 to 3 sets or something. So, about camo textures: I dug some up and I will also say what these will most fit to. This is the TTsMK pattern version 1. 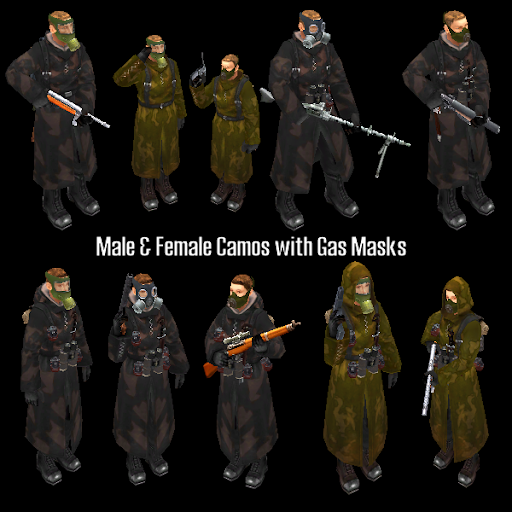 These fit the best for the Terror Gunner/Sniper uniforms that have a Hood, because the Russians gave these out as one piece coveralls with a hood. That is one version of the USMC Pacific pattern. Here is another version of that pattern. 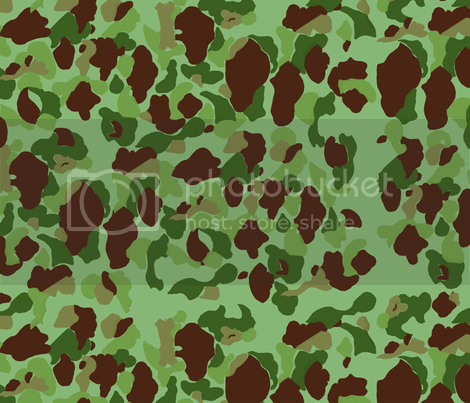 These would fir the US Soldier NPC the best, you could also use the ParaTrooper/Commando Soldier that has the Paratrooper smock for it and simply give the smock this texture ala Paramarine. Here is the thing about the M1942 pattern and how it was used: it was most seen as helmet cover, but the Marine Raiders used both camo shirts and pants while most regular marines either used the shirt or the pants, mixing and matching. I know that this is a bit impossible in the game but just so you know. 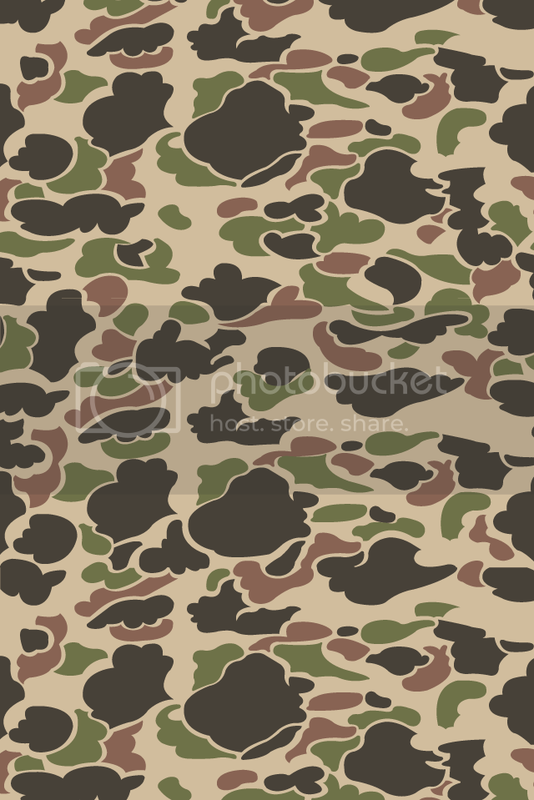 I am still trying to find the texture for the Denison Smock aka Bushstroke. I will post it as soon as I have it. 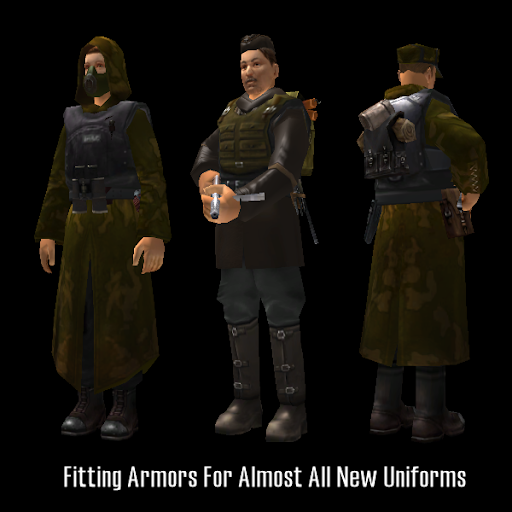 These are perfect for any German Axis uniform that already uses camo, like the German commandos, Paratroopers etc. 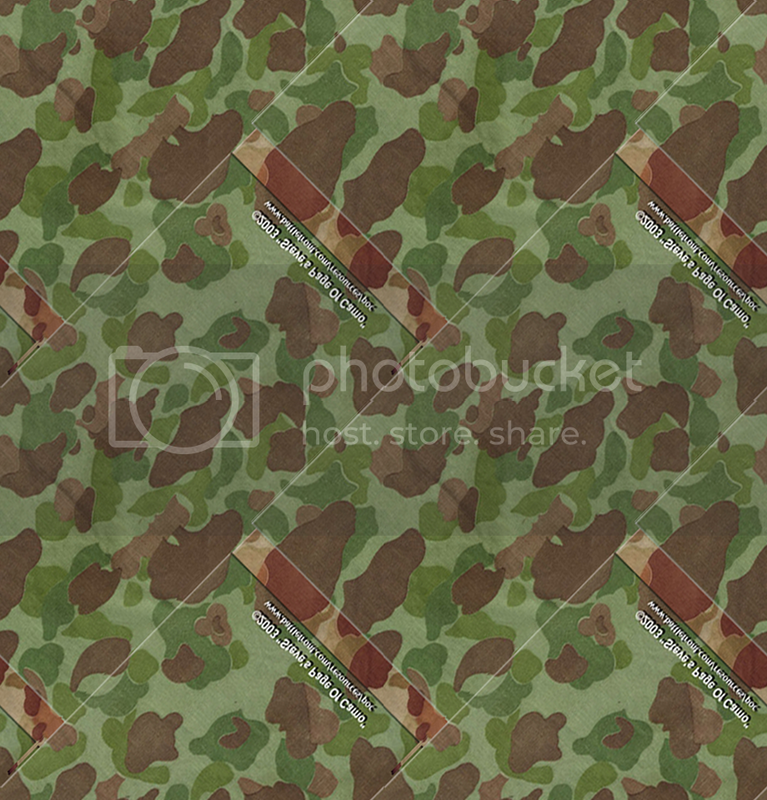 The pack also includes Italian camo patterns that where used by Germans as well. Hell if you want you could even give some of these patterns to the Thor Hammer soldiers if you want to. Grenade range increase - done! Reduced the prices as you suggested (more or less). Still having an issue with updating the number of available copies of the same item. For some reason db table changes to "quantity" don't affect anything. I have a suspicion that the number there might actually mean the probability of any given item showing up at all (since some of the values that were already there were 0.3, 0.5, etc.) Hmm... a bit frustrated here. I'll address the other points you guys brought up a bit later. If he poked his eye out for the Fatherland what else could you expect from a man like that? 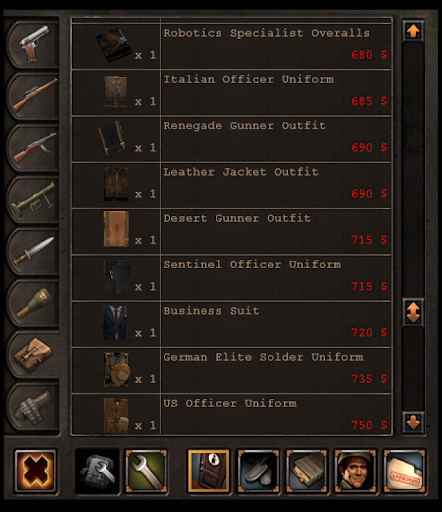 I discovered that some uniforms had armor values of their own. The "Armored Trooper" type. 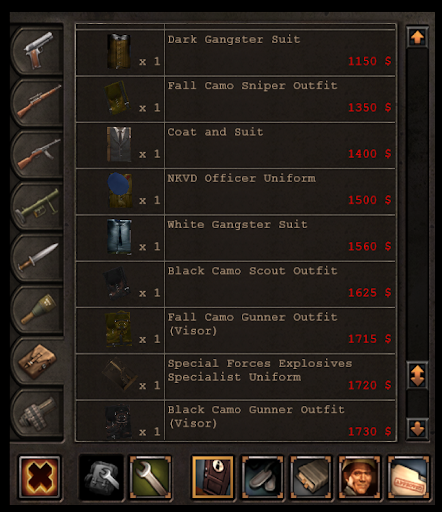 I didn't assign any armor models to them (since they are already - armored) and increased the price. Regular "Armored" are medium armor (40% damage negated) and run at $6500 currently, while the "Elite" - heavy (60% damage negated) run at $11500. I'll test it again and then we can proceed to making new uniforms, perhaps make some uniforms more resistant to damage (now that I figured how to do it). Hey, Lt. thanks for the links. Looks like we'll be seeing some neat camo patterns soon. M10s, thanks for the compliment. At this point I am not even remotely interested in commercial anything. Just want to create new content for one of my favorite games (hoping that the community will assist with ideas and some of the other things). After all after I upload it - it'll be available for playing, right? As for my H&S mod, I might come back to it in a while (not now though).